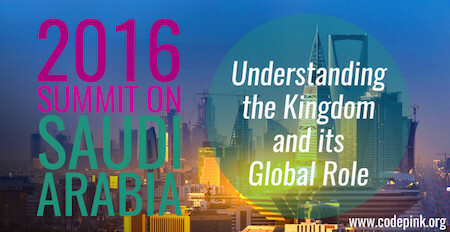 The March 5-6 Summit on Saudi Arabia and U.S.-Saudi ties was a big success! With more than 250 people in attendance in Washington D.C., the event was jam-packed with information and analysis; the entire program is available on the Real Network News website. The summit was hosted by CODEPINK along with the Campaign for Peace and Democracy, the Fellowship of Reconciliation, The Nation Magazine, the Institute for Policy Studies, RootsAction, Middle East Crisis Committee, Peace Action, Friends Committee on National Legislation, Historians Against War, United for Peace and Justice, Veterans for Peace, and many others. The summit ended with a vote to launch a campaign to end weapons sales to Saudi Arabia. Stay tuned for information from us and CODEPINK about how you can join the campaign. FOR THE GOVERNMENT OF SAUDI ARABIA"